3 Bedroom Semi Detached House For Sale in Winchester for Guide Price £595,000. 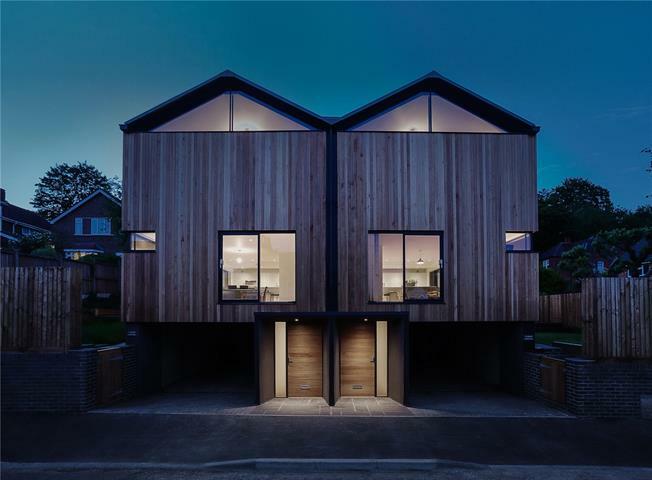 A rare opportunity to acquire one of a pair of stunning townhouses designed by the award winning local architect Adam Knibb. Constructed in 2015, and offered the balance of a 10 year LABC warranty, the property benefits from an innovative use of light and space. The stylish accommodation is enhanced by the neutral colour palette and premium fittings. Access is via a hallway on the ground floor leading up to the open-plan living/dining/kitchen area which is a fantastic space for day to day family living and entertaining. The living area features a wood-burning stove and a glazed Juliet balcony while the dining area has sliding doors opening to the garden. The bedrooms and bathroom are situated on the second floor with the master bedroom serving as a particular highlight with a glazed high level window to the apex provide views of the sky. Enjoying a convenient position in Highcliffe, a residential area increasingly popular with professionals and young families. The compact and lively city centre is within a pleasant riverside walk and offers a wide range of cultural, shopping and leisure amenities. Locally, the renowned Black Boy pub and Black Rat restaurant is within 0.7 miles and planning consent has recently been granted for a new leisure centre in nearby Bar End due for completion in 2021. Communications are excellent, with the mainline rail services into London Waterloo from approximately 1 hour and the M3 gives road access to London and the national road network. Outdoor pursuits are well catered for with walking and biking trails leading out onto the South Downs. The property is externally clad in cedar intended to age beautifully to silver over time. There is undercroft car port with space for two vehicles in tandem and a storage room with access to an internal hallway. Planning has been obtained by the current owners to enclose this area 17/01231/FUL if more accommodation is required. The garden is landscaped with a decked terrace adjoining the house which is ideal for outdoor entertaining and laid to lawn beyond. From our office on the High Street, take the third exit at the roundabout and head north-west on the Upper High Street. Follow the road around in a clockwise direction along the North Walls and bear right onto Union St/Eastgate St. At the Eastgate roundabout, bear left onto Bridge St and then right onto Bar End Road. Follow the road for approx. half a mile. Turn left East Hill then bear right onto Petersfield Road. Turn right into Canute Road and then left onto St Catherine’s Road and then take the first left. The property will then be found on the left hand side just after the right hand bend.